Some things never change. Just like the first erect human beings, we walk. We stand up and place one foot in front of another. We also take our walking for granted. Walking is a way of engaging with the world. Walking is our way of touching the world and being with the world. We literally breathe in the world. When we get up and go outside we can see the sky and the earth and we can be in between them. We walk in our homes, in our neighborhoods and in our cities. Hopefully, we all get the chance to walk in nature. Sometimes we walk purposefully to a destination. The art of walking is walking for the pleasure of walking. Wandering is another form of walking. The faster and longer one walks, the more calories are burned. The faster and longer you walk, the more you see and the more time you spend outside. Did you know that it takes approximately 10,000 steps a day to maintain a healthy lifestyle? How many steps a day do you take? Take the first step. Open the link listed below and read what Thoreau wrote about walking. He wrote from Walden Pond. 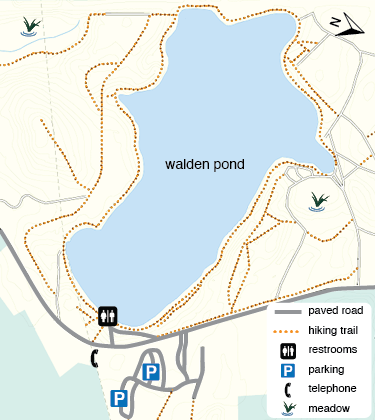 Draw the map of Walden pond with pencil in your journal. Make the legend or key on the left of the page with marker or ink. Take note of the different line weights. Color the pond blue. Use the symbols from the key to suggest the foot path, the meadow, parking, restrooms, etc. Every map has a compass, or north arrow to set the direction. Place a north arrow or compass on your map. The north arrow helps orient the map to the movement of the sun and stars. Early wanderers found their way by navigating with the movements of the heavens. Draw the highways with a thicker, black marker and the unpaved roads and paths with double pencil lines. Label the destinations. Activity 2 – 10,000 steps! Tomorrow, when you wake up in the morning…start counting! Your goal is to walk 10,000 steps. 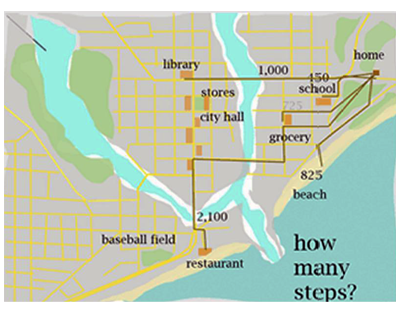 Check out how many steps you take just in and around your house. Enter this in your journal. Next, pick your first destination…such as your school, the park, a store. Take a walk around your neighborhood. Starting from zero, walk there. How many steps did it take? What percentage of 10,000 daily steps is your journey? Keep adding your step amounts in your journal. Try walking 1,000 steps. How far away from your house does this take you? Check your progress. What percentage did you walk by noon, by 6:00pm? Don’t leave all of your walking until after dinner. Always walk where it is safe! Do you ever wander? Wandering is walking without a destination. It is a path of exploration for pleasure. Do you see a country lane that calls to you? Do you hear a sparkling brook that invites you to find its shores? Are you in a city and see a bookstore sign down a narrow road? Are you walking along a fenced garden looking for a garden gate to enter and explore? Are you walking towards a castle or a church or storefront that makes you curious to learn more about what happens inside? Once inside, are you walking around exploring the sites and sounds, feelings of enclosures or views out into the roofscapes of a city? Leonardo DaVinci(1452–1519) made a map of the town of Imola by walking around and through it. When laid over an accurately measured map, it is almost the same! Kevin Lynch(1918-1984), in his book Image of the City, made maps of areas in cities based on observing edges, fields, nodes and landmarks. An edge could be a barrier such as a highway or a place of repose like a garden. It could be either positive or negative. Fields are zones of activities like shopping, housing, parks, etc. They often have entry and exit points. Nodes are where many paths and streets converge. Nodes are perfect for walking as they are full of activity! Landmarks are the visible, memorable moments during a stroll in your neighborhood. Walking for pleasure is an another beautiful way to explore natural and constructed settings. In France, *le flaneur is someone who wanders for the pleasure of exploring his or her surroundings. Think about walking toward, along, into, around and out of your neighborhood. Document your steps using these diagrams. Make a sketch and take a picture every 15 seconds. Record what you are noticing. Are you looking up? Are you looking down? Are you looking around or through? Place your sketches, photos, and observations on a map of the path you chose. Ok. So we all walk. 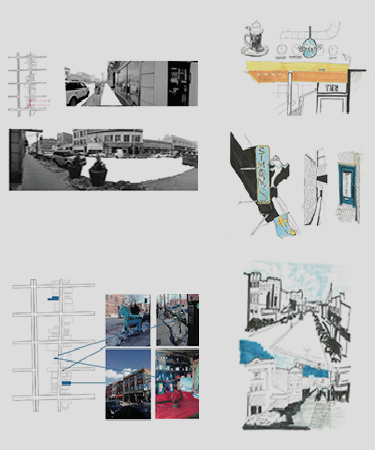 How can we re-imagine walking as a design tool? We can think of walking as sighting, measuring, reading and meditating. When we sight we look at the environment. We take in several thousand edges which define forms and visual spatial references. We take in fragments and views. We observe space, form, volume, texture and detail. We observe human interaction or its lack. We feel the empathy or emotion over time. We also measure distance and time by location, building memory. ‘Reading’ while walking involves learning how to look at buildings and environments and develop a relationship with them. Meditative walking is moving with measured breathing and letting the mind think and associate freely. In this exercise, map a 4-minute walk by selecting five views: beginning, view 1, view 2, view 3 and ending view. Photograph these five views. Then, sketch the five views in perspective. Document the time and place of each of the views on the map. Try to remember what you were thinking at each point along the walk. Measure your memory. Label key buildings sites and events both external (what you saw and heard) and internal (your thinking). You are now working four ways of a walking mapping experience. When you walk in your community, you may find yourself drawn to a walking cluster. A walking cluster could lead you to a pond, a special grove of trees, a marsh area or a stream if you are walking in the countryside. In a countryside cluster you are sure to find birds, insects, animals and a wide variety of plants. If you listen carefully you can often hear a symphony of sounds. 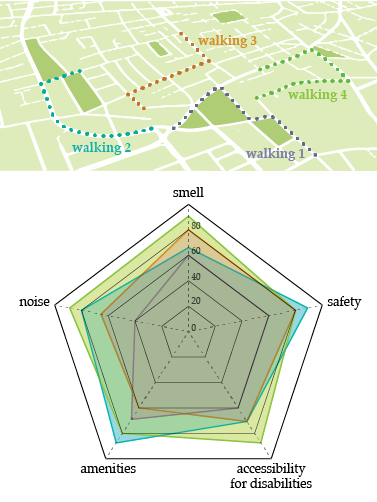 Urban walking clusters are very different. In an urban walking cluster there are many things for people to do. Urban clusters have destinations that attract people. Urban clusters have cafes, bookstores, bakeries, restaurants and many kinds of places to meet, greet and eat. Take your journal on your next walk. Discover a country cluster and an urban walking cluster. Record the sights and the sounds of what you experience and why you are drawn to walk to these particular destinations. Check out NEXT.cc’s Sound Mapping Journey to sound map your walking cluster! Try NEXT.cc’s Site Analysis Journey to investigate your walking cluster and learn what makes it unique. Write about your discoveries and combine your thoughts, reflections, diagrams,drawings, maps and photos into a walking cluster poster. When you walk you discover! Now that you are starting to seek out walking clusters, consider taking a critical look at the quality of your walks to reach destinations. Some walks are more inviting, safer and attractive. What makes a walk a ‘bad’ walk? What makes a walk a good walk? You can read, What is Your Walkscore on a site called Jane’s Walk. Create three to five categories. Try Bad, Good, Better, Best! Check out the Walkability Checklist and think about what things you want to critique. Consider noise, smells, safety, condition of sidewalk, quality of landscaping (or lack of landscaping), seating, lighting, amenities, etc. Remember to see if there is a place for everyone including strollers, runners, bikers, small children, older people and even pets!. Are the streets for cars AND people, or just for cars? Create a chart that you can take data on at least three walks of similar durations. Remember to look for accessibility for people in wheelchairs and deaf and blind walkers. Are the street crossings marked and in the right place? Are there fun and interesting things to look at and to do? Make a chart. Add photos of key points. Rate your walks. Share with your class. Post in your local paper. Jane Jacob (1916-2006) was an urban thinker, writer and activist. She introduced liveability as a common sense, community-based approach to decision-making in cities. She wrote in her book, Downtown is For People, “No one can find what will work for our cities by looking at….suburban garden cities, manipulating scale models, or inventing dream cities. You’ve got to get out and walk.” Jane’s Walk is a community-led conversation about the history and built future of a neighborhood. Jane’s Walks are organized the first weekend in May in cities all over the world. You can organize a Jane’s Walk in your city, too! Your walk can explore anywhere. 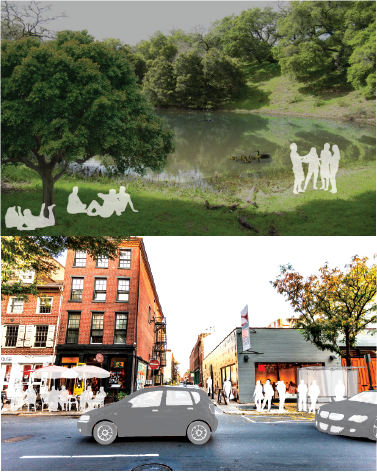 You can get your walkability studies and toolkit on the Jane’s Walk Site. We only spend 50% of our lives indoors. Walking 2,000 steps a day helps maintain a healthy body weight. It is improper to wander. Walking is a natural form of exercise. Walking can connect us with our inner thinking. 25 Reasons to Sneaker Up & Go For A Walk!